The Bailey School Kids is a fun beginner chapter series for the lower grades like late 1st grade and 2nd grade. Each book is a different story about the teachers at Bailey School. 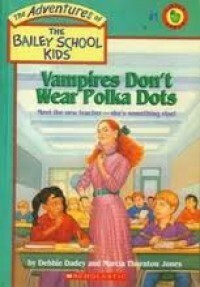 This one is Vampires Don't Wear Polka Dots and the kids are convinced their teacher might be a vampire but of course, vampires don't wear polka dots. I think this is just a fun series for kids to read for fun, free reading, it doesn't take a lot of thought but its funny and will help get kids into reading chapter books.